With the words "Get in" and a moment of silence while he surveyed the crowds, the singer launched into Flick Of The Finger, the first song to be heard on the Other Stage at Worthy Farm this year. Despite the relatively early hour and the mud underfoot, thanks to a downpour of rain that lasted all night, thousands of people turned out to see the band. Their performance was unbilled but Liam had dropped heavy hints about it on his Twitter account. Although the Mancunian was wearing sunglasses, they were mostly not needed as grey clouds hovered over the Somerset site, with the sun trying to break out. The biggest cheers came for Oasis hit Rock 'N' Roll Star and, perhaps aptly for the time of day, What's The Story Morning Glory, which turned into a mass singalong. 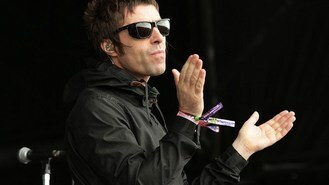 It seems the singer was also surprised to be awake, grumbling to the crowd at one point "11.30 in the f****** morning". But he later added: "It's never too early for a bit of rock and roll echo." He had previously complained about the sound system at the festival after Oasis played on the Pyramid stage in 2004. Liam apologised to festivalgoers for making their headaches worse if they had one, and told them with his typical swagger as the set came to a close: "You've been amazing. But not as good as us. "Have a good day, weekend, life." His partner, Nicole Appleton, was among those watching the performance at the side of the stage.